Whether you’re constructing a new house or simply looking to renovate your current one, a gas fireplace in Kalamazoo may be the perfect way to create new aesthetics and even increase your home’s value! While wood fireplaces are another great heating option, they are typically not as efficient as their gas counterpart and can be difficult to take care of and operate. In this post, we will look at the things you will need to consider when installing a gas fireplace in Kalamazoo. There are two venting types: vented and vent free. In general, most people elect to use direct vent units whenever possible. Vent free units are also an option and are installed when venting is not an option. They use an oxygen depletion sensor that monitors oxygen levels in order to ensure safe combustion. There are two types of fuel typically used with gas fireplaces: natural gas and propone. Natural gas is used most commonly in suburban or urban areas. These areas benefit from the fact that natural gas burns cleanly and efficiently while keeping operating costs low. Propane is more often found in rural locations where there is a large tank, usually white, that feeds the gas fireplace from outside the home. You should always make sure you have enough space to adhere to minimum clearance standards. You should also make sure that the venting configuration you choose is safe and up to code. 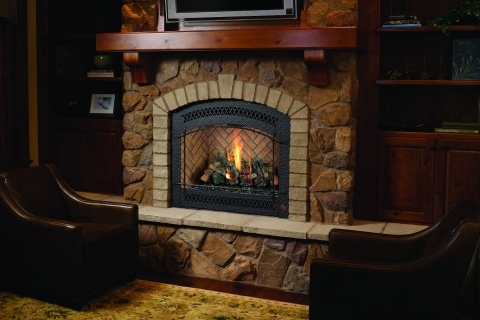 At Hodgson Light and Log, we carry a number of gas fireplaces in Kalamazoo. Together, with Fenner Builders, we will work with you to find the right gas fireplace for your home. Fenner Builders has been installing fire places since 1971! Do not hesitate to contact us today for more information!